Bob-ombic Plague is an 8-player minigame in Mario Party 7. Its name is a pun on the Bubonic plague. 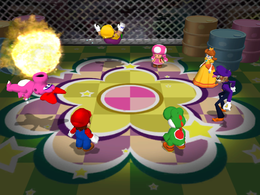 The eight players pass around a Bob-omb. It will naturally turn red after a while, and the objective is to prevent the Bob-omb from exploding when it reaches the player. If the Bob-omb explodes in the player's hands, he/she and other adjacent players will be blasted away. The game thus starts with eight players, then goes down to five, then two and finally one. The last player standing wins. If two remaining players are on the same team, they both win. Rules – "Form a ring and pass the Bob-omb to the next player. When it blows, players on either side will lose!" Advice – "When the Bob-omb turns red, it's ready to blow. Quick! Pass it on!" This page was last edited on March 25, 2019, at 01:04.